It’s rare that I use this platform for anything but travel reports, but I do want to raise awareness for a cause that I am raising money for, as it is very close to my heart. Please do not feel obligated by any means, but I want to get the word out as best I can. On October 7th, I will be participating in JDRF One Walk® to raise money to work towards a cure for type 1 diabetes (T1D). I do this in honor of my father, Tony Clay Martin. 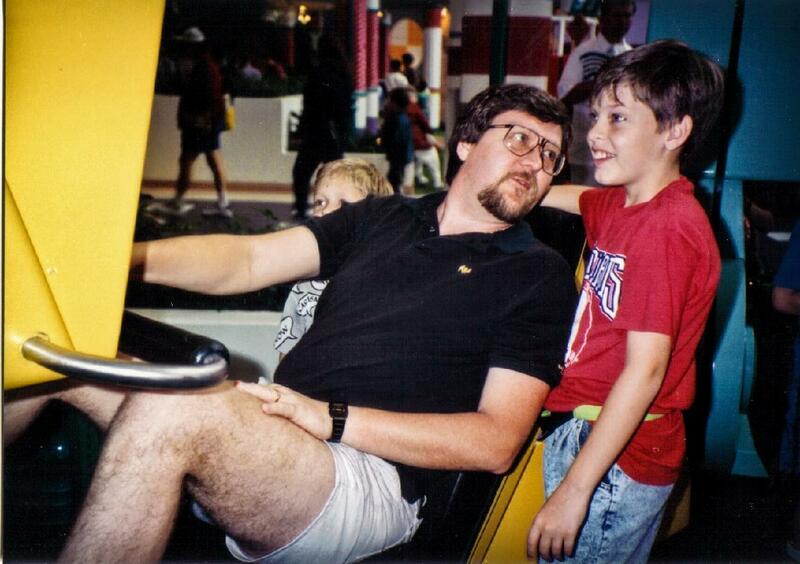 In 1991, around the time of his 35th birthday, Dad received some unexpected news. After a standard checkup through his workplace, he (along with several of his peers) was told that he was a Type-1 diabetic. If you’re not familiar, Type-1 diabetics stop producing insulin. Even with the most vigilant management, a significant portion of their day is spent with high or low blood-sugar levels which can lead to unpleasant side effects and long-term damage. Dad’s diagnosis explained his mood swings and some peculiar cravings he’d bee having for a while. Life changes had to be made immediately to manage this disease. As a ten-year-old, I learned how to help. I learned how to manually mixed his insulin and help recognize symptoms of low blood sugar. Over the years, it just became a regular part of life…but it takes constant awareness. When Dad passed away suddenly in 2011, his kidneys were beginning to fail and other medical complications were slowly manifesting. Although we don’t know what caused his sudden death, his body had been severely taxed by diabetes. I know it was a contributing factor. With T1D there are no days off and there is no cure…yet. I’m asking for your support for life-changing research that helps people with T1D live healthier and longer, until a cure is found. Thank you for reading; I’ll see you on the road! It’s hard to believe that I’ve been coming to the Con since 2010. A lot in my life has changed since that first trip to Atlanta…but one thing that hasn’t changed is the fact that the Con is a great big party. It’s filled with people of all kinds and all passions: if you have a little piece of pop culture that you absolutely love, you’ll find your family here. I’ve developed a wonderful Con Family that I seek out every year. I arrived earlier than usual on Thursday, flying out of Tulsa at 6:00 AM. For the first time, I took Atlanta’s light rail (MARTA) into downtown. It couldn’t have been easier. In fact, it brought back the feelings of taking mass transit that I experienced while abroad. I sure wish Tulsa had a stronger transit system. All that being said, I was able to arrive at my hotel downtown and check-in well before noon. That gave me a lot of time to explore before the Con started on Friday! Although, really, the Con doesn’t start on Friday anymore. It starts on Thursday. And, really, it’s getting busier on the Wednesday and even the Tuesday before. I couldn’t believe how packed everything was as I wandered the Hyatt, Marriott, and Hilton lobbies. Thursday is no longer the ‘quiet day’ of DragonCon. I saw just as many A-Game costumes at the Marriott Atrium that day than any of the other days. DragonCon is made up of many parts: celebrity panels, creative workshops, vendor booths, gaming halls, cosplayers, and a parade that lasts nearly two hours. In and around those happenings are nearly 100k fans of all ages celebrating every imaginable aspect of pop culture. Since there’s so much to do, everyone gets to make their own Con experience. My Con consists mostly of wandering the host hotels with my camera, taking photos of my favorite costumes. I am consistently amazed at the craftsmanship on display. Although I didn’t dress up this year, I was able to share in the pride of many others that did. There’s always a trend. This year, there were far fewer Harley Quinn’s and a lot of the Deadpools were of higher quality. A ton of costumes integrated portable speakers and music. And a lot of the photographers were taking video…I’ll admit I got annoyed more than once when someone was commanding cosplayers to do different things while they walked back and forth to get certain shots while I just stood and waited. It was a long weekend in the best way. I spent time with friends I only see once a year, sharing meals and having great conversations. In fact, that quality time meant I took fewer photos this year since 2010; no regrets! Below are a few of my favorite costumes from DragonCon 2018. My full photoset is available on Flickr here. To my friends in Atlanta: thank you. It was a magical weekend. SPACE FORCE! There were dozens of cosplayers around in various costumes dedicated to the current administration’s passion around a new branch of the military. A great re-imagining of Ariel from The Little Mermaid. Phenomenal detail on a costume inspired by Mad Max: Fury Road. I love it when cosplayers come toghether – like these Cinderella Step-Sisters and The Queen. This Bob Ross guy was actually painting! Best Judge Doom I’ve ever seen – great props including a squeaking shoe! Many scary clowns this year (many from IT) – this was my favorite! Strong Pro Wrestling representation in 2018 – including this picture-perfect Macho Man. It’s easy to phone in a Dread Pirate Roberts costume – this one is stellar! Great detail with him and Princess Buttercup. Back to the Future III group – what a great Buford Tannen! I spent last weekend in Springfield, Missouri in the company of friends. It was the 8th annual Birthplace of Route 66 Festival and I had a vendor booth in the Old Glass Place, a historic venue near the iconic Abou Ben Adhem Shrine Mosque. When I attended my first Birthplace festival in 2015, I told my wife that one day I’d have a booth at the festival and I’d feel like I had “made it.” Well, there I was with my photography and other goods three years later. Mike Ward was even kind enough to deliver my custom-painted Jack Rabbit Trading Post sign from Arizona! The whole weekend was a lot of fun. Each evening, a large group of roadies got together to eat, drink, and be merry. It’s a great environment for collaboration, too. That first night I drove to the Rest Haven Court to take photos of their neon sign which I’d only previously seen in the day. I parked a block away and waited for the tubes to light up as the sun sank below the horizon. After a few minutes, another photographer approached the sign. It was Efren Lopez, a man I hadn’t had an opportunity to get to know but whose work I really respect. I stopped lurking and parked closer so we could chat about our mutual love of neon. Thanks to Efren asking the office manager, the sign finally lit up to match the beautiful Ozark sky. On Friday morning, I took an early drive south to the town of Ozark. They had a few old truss bridges that had been on my map for a while that I wanted to capture. The light was wonderful as I flitted about the Green Bridge, a 1912 span courtesy of the Canton Bridge Company from Ohio. The single lane was open to traffic, though its sister bridge two miles west was not so lucky. Significant flooding a few years ago damaged several bridges in Christian County, some of which never re-opened. The Riverside Bridge was recently purchased by Bass Pro Shops in Springfield and will be moved/reopened. That’s great news! The days of the festival itself were festive indeed, with fleets of classic cars on the streets and a constant sea of humanity. My booth neighbors were Susan Croce Kelly (who wrote a book about Cyrus Avery) and David Wickline. David has been a figure in the Route 66 world for many years and I loved getting to talk to him about his various projects. His current push is to build a replica of the 66 Courts Motel in Kingman, AZ. The weather was good during the day but a Friday evening a pop-up thunderstorm threatened to cancel the parade. Our group watched from second-floor windows as the downpour faded away and the parade started…only for the rain to return suddenly with a vengeance. I felt bad for the folks on floats and riding in vintage open-top automobiles…but at least there was no hail. In too short a time, though, it was time to say goodbye and head home. I left Springfield early Sunday morning and hopped on-and-off the interstate to stop at a few Route 66 spots like the Gary Turner’s station in Paris Springs and the Boots Court in Carthage. It’s always nice to visit with the people of the road, even if it’s just for a few minutes. My final stop on the way home was at the Hi-Way Cafe in Vinita; if you missed my previous post about that visit, check it out here. The food and company were something to write home about! On the way home from Missouri this weekend, I stopped for lunch in Vinita, OK. Normally, I’d stop in at Clanton’s…but today I opted for the Hi-Way Cafe just west of town. I’d heard good things and the timing was right. I’m very glad I did. I pulled in to the gravel lot to find it quite full. I walked around the building and took a few photos before heading inside. I took a stool at the counter; an old man that had walked in behind me took the seat to my right. “I saw you takin’ some pictures outside,” he said as he sat down. “That’s good! They’ve got some good stuff to photograph,” he said proudly. I remarked on the murals I’d captured as a waitress came over. “Hi, Leonard,” she said with family-like familiarity. “Coffee?” she asked, though it was mostly rhetorical. I followed his lead. We ordered our food; a single biscuit and gravy for Leonard and a burger for me. “Where are you from?” he asked as our tickets were passed back to the kitchen. I said Tulsa and the old man searched his memory again. “I had family in Tulsa that we’d visit from time to time. When we’d get to town, I remember seeing a tower. No, I think it was three. They was at Denver and Pine. We’d drive all the way into town, stay a while, and pass those same towers on the way home.” I smiled and told him I knew what he was remembering: the old KVOO towers on the east edge of town…also on Route 66. I added that KVOO was the station that broadcast Bob Wills to the masses back in the day and it sparked another memory for Leonard. Our conversation dwindled once our food arrived; it was delicious. Leonard noticed a group of guys at a nearby table and chastised them (between bites) for not mowing their grass in a timely manner. Something about a ditch and right-of-way, but I tried not to eavesdrop. I looked around and noticed the entire place was filled with locals; I appeared to be the only out-of-towner. That’s good; that means this place should be around a while. I finished my meal and thanked Leonard for the enlightening conversation. I stepped over to the cash register and our waitress fiddled with an iPad so she could take my debit card. “How was everything?” she asked with genuine interest. I said everything was perfect. “Is this together?” she asked, nodding towards the old man who was still engaged with his neighbor. I smiled and nodded. It’s a small price to pay for a local history lesson. Last weekend, I took a trip west to the Texas Panhandle. It was finally time for Texas Welcomes the World, the 2018 International Route 66 Festival! It had been a long time since I’d seen many of my roadie friends and I was excited to attend my first “official” International Route 66 Festival. I arrived in the early afternoon of Thursday, July 12th. When I was in Shamrock last fall, I pre-booked a room at the Western Hotel across from the famous U-Drop Inn. I’ve written about the stunning Art Deco service station before; it’s an Americana treasure. Every night at dusk photographers descended on the neon icon like a swarm of moths. Truthfully, the Conoco Tower is outlined in LED thanks to significant hail damage a few years back — but it looks spectacular. My first stop wasn’t the U-Drop, but in the town of McLean 20 miles west. Shamrock is the home of about 1,950 people. Rather than try to cram everything into the small town, events were spread out to surrounding communities. McLean is the home of the first Phillips 66 Station in Texas and the Devil’s Rope Barbed Wire Museum. The first official event of the festival was an unveiling of two models made by the late Willem Bor. Willem was a big inspiration for me early on…I even gave him and his wife a tour the last time he was in Tulsa. It was important that I be there to honor his memory. As expected, the models were stunning. Willem was a really gifted artist and made most of his models with only photographs as his guide. Models representing the Super 66 Station in Alanreed, TX and a Whiting Bros service station in Shamrock now have a permanent home and get to be enjoyed by thousands of people each year. The unveiling event was also the first place I ran into my roadie friends like Dora Meroney and Steve Rider. The community of Route 66 enthusiasts that flood these gatherings is the real reason I come out. It’s like a family reunion! For most of the weekend, the Shamrock Community Center was where I could find most of my friends. They were selling goods or sharing collected memorabilia in a giant vendor hall. Each evening, we broke bread together. Well, as many of us that would fit. We tended to overrun every restaurant in town. There aren’t many overflow options in a place like Shamrock but we made do. A few days back, I wrote about a lunch I had in nearby Texola, OK that you should definitely check out if you missed it. Saturday night we had a big banquet and concert by The Road Crew, the unofficial band of Route 66. The Road Crew performs at a great many Route 66 events; they even wrote an entire album of original music inspired by the Mother Road. They’re not just a band, they’re true roadies themselves. I always enjoy hearing them live in the company of so many like-minded folk. It also fun to hear their song about Ron Jones sung while he’s in attendance! My weekend wasn’t all about Route 66. I took some time to do a little exploring since I wasn’t anchored down in the vendor hall. I drove out to Clarendon to see their courthouse and unusual amount of public crosses (read more about that last bit here.) I stopped in Claude to take photos of an old service station. And I drove out to Palo Duro Canyon south of Amarillo, the second-largest canyon in the country! It was beautiful. Every afternoon, storm clouds amassed and threatened…but I only got rained on once, that first day in McLean. Let me tell you, though, it was a gully washer! In what felt like a matter of hours, it was Sunday morning and time to go home. The last event of the festival was the traditional e-Group Breakfast, which was also a first for me. Mike Ward, a well-known roadie with a vast postcard collection, has also run a Yahoo Group for Route 66 since 1999. For many years, the group has organized a breakfast gathering at the International Festivals. In addition to catered food, door prizes are given out thanks to the many donations from the e-Group members. There’s always enough for everyone and, sometimes, enough for two rounds of giveaways. One of the items I walked away with came with a Certificate of Authenticity! It’s a small box of debris from the Painted Desert Trading Post, a Route 66 landmark that has been abandoned since the 1960s. It’s been mostly unreachable since that time and is starting to fall apart finally, but a Co-Op of 10 Route 66 enthusiasts banded together to buy the property. They’re working to arrest further deterioration of the property and ensure it remains available for decades to come. I know a small box of rubble sounds weird to non-enthusiasts, but it was a big deal to me. All-in-all, I had a great time. I made many new friends like Gary Cron from California, Dan Oberlin from St. Louis, and Guy Randall from Colorado. These guys were long-time roadies that had a wealth of knowledge that I soaked up like a sponge. It was sad to say farewell, but I knew I’d see many of these folks in a few weeks at the Birthplace of Route 66 Festival in Springfield, Missouri. There’s always something happening on the road! This weekend, I drove out to Shamrock Texas for the International Route 66 Festival, “Texas Welcomes the World.” I’ll have a lot to say about my time here later, but today I want to share with you a little place just on the Okie side of the border in Texola. By the time the Post Office was built in 1901, Texola had already been through several names (Texokla and Texoma) and had switched from being a part of Texas to Indian Territory multiple times; it seemed to change every time someone surveyed the area. Oklahoma became a state in 1907 and forever placed Texola on the Oklahoma side of the border. Route 66 was established in 1926 and the little town grew to nearly 600 people by 1930. However, the Great Depression and Dust Bowl era stunted the growth of this little town. Today, Texola is home to 36 residents spread out over less than one square mile. In early 2013, a new business sprung up in this quiet ghost town: the Tumbleweed Grill and Country Store, also known as Water Hole #2. Artist Masel Zimmerman moved to Texola from Florida some years back. She completely renovated a 1930s-era building and created a restaurant within spitting distance of the Lone Star State. Her little building is the modern day equivalent of a classic general store. You can get groceries, clothing, motor oil, necessary items, and of course Route 66 swag — much of it customized for Texola or the Tumbleweed itself. But there’s also the cafe, which is what brought me through the door. When you walk into Water Hole #2, you greeted by a handful of simple tables. The food is traditional roadside fare, all freshly prepared. I’d heard the burger was good, so that’s what I ordered. As my lunch was being prepared, I sat in the relative silence and admired Masel’s artwork on the walls. It was comforting to enjoy my iced tea with only the sound of the ceiling fans and the distant sound of a spatula scraping a skillet. There was no waitstaff; Masel handles everything herself. The burger was, in a word, tremendous. The beef was fresh and the fries were hand-cut. The top bun had been quite literally branded with a Route 66 shield. The flavor was pure and simple. I’ve had a great many burgers in my life and this was one of the best. Afterwards, I browsed the gift shop and met a traveling trio that stopped in as they traveled from Nashville TN to San Francisco. The Mother Road calls to them all. Masel and I talked for a few minutes before I headed back to Shamrock. She said business was really down this year and lamented the loss of Gary Turner in Missouri a few years ago. He’d been a big supporter, making sure travelers know to stop at her border cafe. She said that she has some days where she doesn’t have a single customer walk in the door. The Tumbleweed isn’t visible from the interstate and the vast majority of her business comes from Route 66 tourism. Even then, getting the word out can be difficult in the modern age. I took her card and told her I’d tell everyone: stop in and see her if you’re in the area! You won’t regret it. Needless to say, I’ll be stopping in to see Masel any time I’m out this way. Here’s a great video my friend KC Keefer put together in Tumbleweed’s first year. Very little has changed!